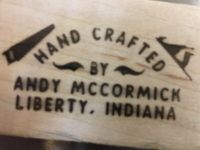 My name is Andy McCormick and I build custom kitchens, built-ins and fine furniture. I'm a 1 man cabinet shop and have been doing this type of work for 17 years. I specialize in cherry and quarter-sawn white oak pieces but will work with just about any type of wood species. I pride my self in providing the upmost craftmanship and quality in my work. I use U.S. made materials whenever I can to ensure the highest standards of construction. Do not be fooled by these companies that import their products from China and just assemble them locally. I use U.S. Made formaldehyde free plywood and not the chinese plywood that my competition uses. I have a well equiped shop that allows me to turn out quality pieces in a reasonable amount of time.